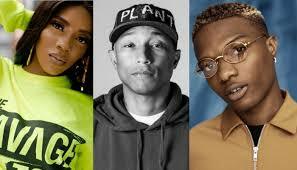 Wizkid and Tiwa Savage Join Pharrell Williams, David Guetta, to Feature on Global Citizen EP – Royal Times of Nigeria. Nigerian pop stars, Wizkid and Tiwa Savage joins a host of other world music stars including Pharrell Williams, David Guetta, Stormzy among other artistes who are contributing new music to Global Citizen EP one, a four-track collection being released by the International advocacy organization Global Citizen, in partnership with Warner Music Group’s U.K.-based Parlophone and U.S.-headquartered Atlantic. While the EP is scheduled to be released on all digital platforms on November thirtieth, a track off the body of work titled “E-Lo” by Los Unidades and Pharrell Williams, is already available. Proceeds from downloads and purchase of the EP have been earmarked to help support campaigns and advocacy efforts to end extreme poverty, as well as other causes like gender equality, education, water and sanitation. The Global Citizen Festival: Mandela 100, to mark the centenary birthday celebration of the iconic South African leader will feature performances by Beyoncé, Jay-Z, Ed Sheeran, Wizkid, D’Banj, Femi Kuti, Tiwa Savage and Usher, among others.